This absolutely remarkable 2 bedroom/ 2 bath home in downtown Clemson was built with tons of added architectural details which incorporates past history with the present. Not only is it built with Clemson University Stadium remnants, but it is also within easy walking distance to the Clemson campus, Memorial Stadium and downtown. Directly across the street from the front of the home is Clemson University property. So if you love all things Clemson and want to live in the heart of all the action, you will love this home! Opening the front door, notice that the door is one-of-a-kind and hand crafted out of wood from an old farmhouse in South Carolina. The absolutely gorgeous brick floor in the foyer, eating room and both fireplaces are made from brick salvaged from a Florence County tobacco warehouse. Also notice the unique wood doors built into the fireplace, as well as, the downstairs back door which are both built out of old seating from Clemson Memorial Stadium. To the right of the foyer is a sunny office, living room or dining room depending on your needs. To the left of the front door you will find a very spacious master suite with 2 closets, 2 seperate dressing areas boasting plenty of built-in cabinets, a tub/bath combination and large linen closet. The kitchen has 3 large windows from which you can see the wonderful back woods and creek. There is a built in oven, cook top, disposal, dishwasher and a TON of cabinets. Down the hall you'll find a laundry room with again many cabinets, a laundry sink and the washer and dryer convey with the home! To the right of the laundry is a built-in desk and shelving. The kitchen opens into a charming dining area that displays rustic custom built wood cabinets and drawers built from wood found in a old horse barn in Westminster, vaulted ceiling with beams of hand-hued long leaf pine from an old cabin and beautiful brick floors. From the eating area, notice the rustic wood wall on the left leading into the den which was taken from the same horse barn in Westminster. The mantle on the true masonry fireplace is the same hand-hued long leaf pine from an old cabin that was used for the ceiling beams. 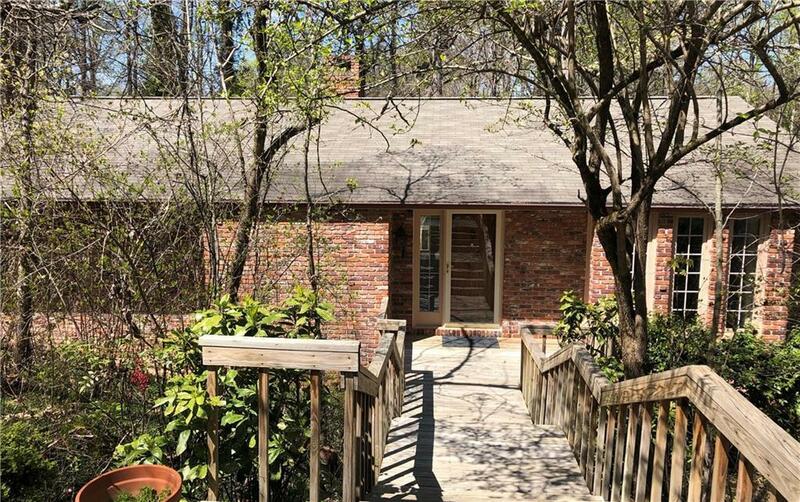 Off the den you will find a wonderful large deck which extends across the majority of the back of the home and features steps leading down to the back yard. Downstairs is an efficiency kitchen and den area with sink, range, refrigerator and second fireplace. All appliances upstairs and down will convey with the home. There is 1 bedroom downstairs and another room which has always been used as a 3rd bedroom plus a second large bath. For the handy man, there is a very large work room off the den that has built-in shelving, workbenches and opens onto the downstairs porch. The front and back yards are natural with no grass to maintain! You will also find a small creek running through the back yard. The roof, HVAC units, and hot water heater were all replaced approximately 2 years ago! All information is deemed reliable but not guaranteed! Buyer and buyer's agent to verify all information and numerical representations if deemed imprtant to the buyer.